This one is on its way to a customer who lost someone very special - he asked me to make a set to celebrate their life. I hope I succeeded. The matching belt is in the works as well. It is an Uncle Lou Model, that will be the home for a Yo-Bo Commander. 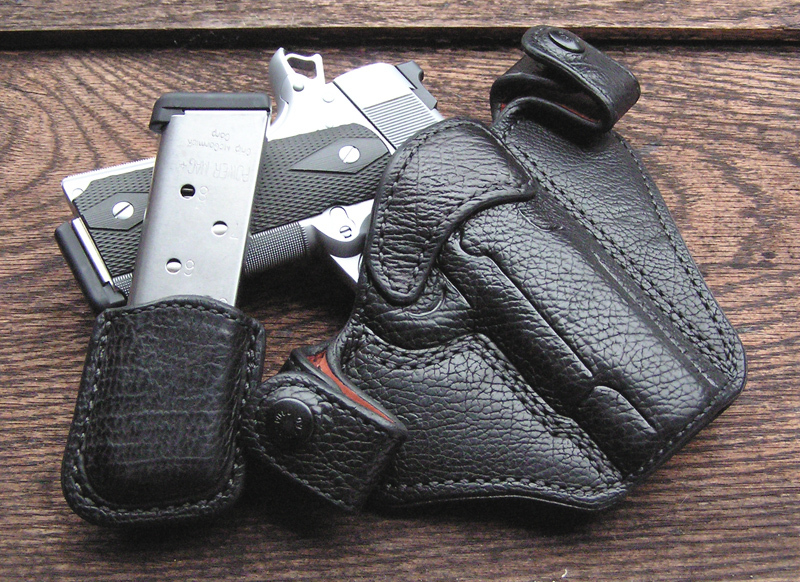 The holster is fully Lined with 8 oz. cowhide (the same stuff I use for all my holsters), and has Full Coverage Shark, which gives this one a really classy look. The shark is from a very small hide (barely enough to do the holster), and I think that the young age of the critter is why this one is a bit unique. It doesn't have the large texture often seen with shark, but the subtle grain on this one is really pretty. I have often found that lined holster really take the molding well, and this one is no exception - even with minimal boning this one really snaps in place (any more boning and drawing the gun results in a bit of discomfort with your trousers going where they ain't supposed to). The Mag Pouch is an SSP, with the same 8 oz. 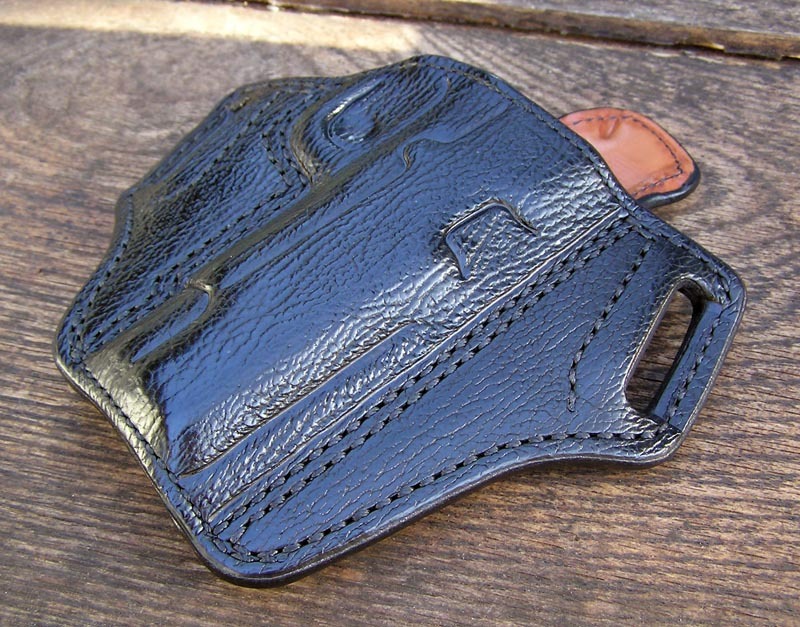 cowhide base as the holster. Last edited by John Ralston on Fri Oct 10, 2008 8:10 am, edited 3 times in total. Location: Commonwealth of Virginia !!! Oh my goodness John, and yes you have succeeded, it is absolutely beautiful and the exceptional craftsmanship can clearly be seen in that picture. What may be harder to see, but is so clearly evident to me, is the heart you have put into this project, an awareness acquired in part through our many emails and conversations. When I selected you John, to build something very special for me, I was looking for more than a quality job, I was looking for a quality man to do it, and you have delivered. We can both be proud, and I am very much looking forward to the belt that will tie this all together as the truly custom work that it is, and fitting tribute to my son. Well done John. The execution on the holster and pouch is perfect. I don't presume to know the situation (obviously I don't), but that is one of the most remarkable rigs I've seen you display. Well done sir. Astark, sorry for your loss. People sleep peaceably in their beds at night because rough men stand ready to do violence on their behalf. Very nice set up John, the new owner will surely love it! "Let us speak courteously, deal fairly, and keep ourselves armed and ready." That set up is exceptionally executed. 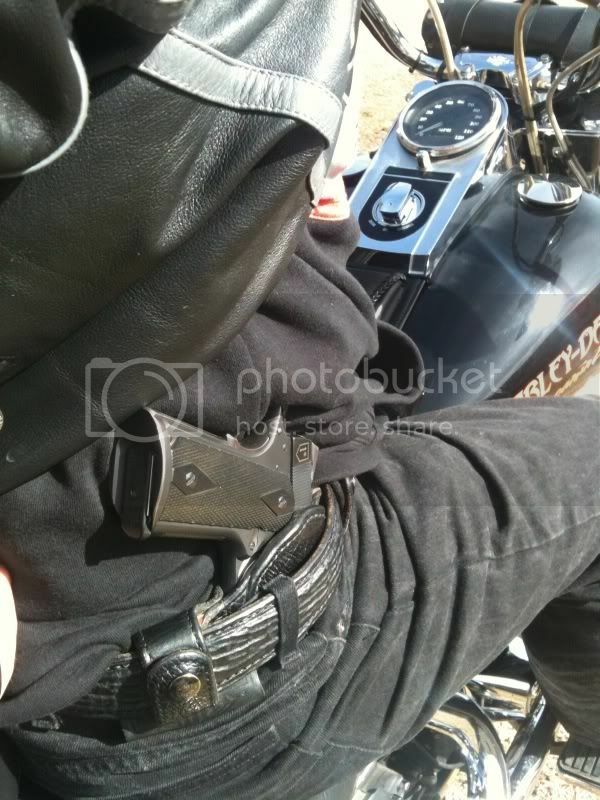 Give some details brother, what holster, material, man I love your work. The IBS's are very popular at the Sheriff's Office. Thanks again for not only helping my guys but the outstanding holster you did for these folks. Great job. 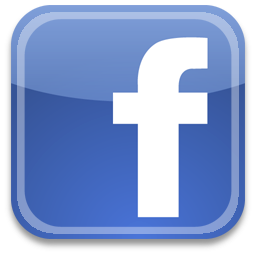 It is on its way....if you have ANY issues with it, be sure to get in touch with me ASAP. John, your work gets more beautiful every time you post something new. You truly are a master of your craft right up their with Lou, Tony, Gary, Matt and a couple others. I have received the holster and mag pouch and I just gotta say, they look even better in person than in the picture, and the fit is just plain amazing. This is top quality workmanship here in my hands, and I could not be happier. I am very much looking forward to the belt that will tie this all together as the truly custom work that it is, and fitting tribute to my son. I just received my belt and it is perfect, just plain amazing, and I absolutely love it. My wife cried when she saw it, she knows how much this project has meant to me, and you have truly done what we had hoped for. The gear I have received so far has greatly exceeded my expectations, which were very high to begin with. And yes, I did say so far, as I have something else pretty special in the works. Oh boy, this is one package I can hardly wait to arrive, absolutely beautiful and like everything else I have received so far will probably look better in person than on my monitor. And I can see myself now, standing next to the wife in the mirror as we get ready to go out, saying "honey, do you think I should wear the IWB or OWB with this outfit". But I can assure you I will still be the first one ready. John, You have certainly outdone yourself on this one. Absolutely stunning! Hey Lou, it's good to see you back! Hey John and forum members, just thought I would post up and update on my leather. My gear is not only holding up well with zero problems, but getting more and more comfortable to wear. I am happy to report I have gone in a notch on the belt holes and still have plenty of room to go either way. I was at my daughters yesterday and she took this pic. My gear has been exposed to rain, mud, sand, ice, snow extreme heat and cold. All I have even done to maintain my gear is to wipe it off with a wet rag. But just this morning got to wondering, should I treat it with some kind of conditioner or anything, or just carry on as I have. Thanks for the feedback Alan! Nice, making me reconsider and choose an IWB instead. I have both IWB and OWB and to tell you the truth I prefer the IWB, and I wear it the most. I have gotten so used to it I hardly even notice I'm wearing it. I also have another IWB that for some reason is not as comfortable. 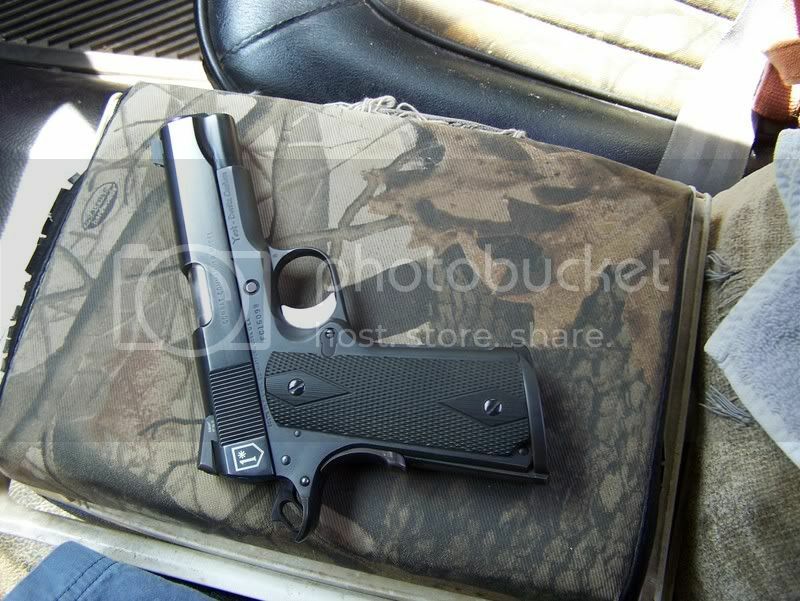 And I am thinking about mounting it to the back of this ice chest center console. Hey John, just wanted to let you know my gear is now very well broken in, performs flawlessly and is holding up great. It has been wet, muddy, bashed and crashed, but is still some of the most beautiful works of art I own. I love this stuff even more than the day I received it, and it was love at first sight to begin with. And I thank you so much.